Jumia, Nigeria’s leading online retailer, has a section dedicated to offering you everything you need for your wedding at great prices. 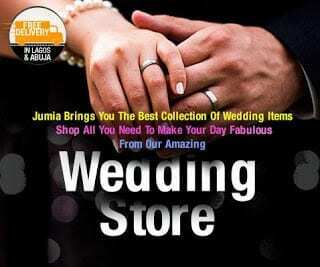 The Jumia Wedding Store was launched in 2013. At the Jumia Wedding Store, you can shop for Bridal dresses, Grooms tuxedos, bridal maid’s dresses and suits for the grooms men, accessories and shoes as well as souvenirs and gifts by just clicking a button. Jumia Wedding Store will feature top Nigerian Designer brands like David Wej, Ethina, Style Shoes, Eternel, Julliana Rose, Hatz & Souls and House of Fabric. Buy everything you need for your wedding at great prices at Jumia. The Store also offer souvenirs and gifts, to enable friends and family of the bride/groom shop for items for the wedding guest like mugs, bath wraps, brides bible, luggage tags, Passport covers pedicure sets etc at affordable prices with selected gift wrapping options. To commence the launch of the first Online Wedding store in Nigeria, Jumia in Partnership with Jovago.com is offering One lucky couple a short stay honeymoon at a five star hotel of their choice in the Major Cities in Nigeria. The honeymoon will be a romantic weekend getaway for the couple with full luxurious package. To participate in the Wedding Promotion couples have to purchase a wedding dress or suit or collective wedding items of N90,000 and above from Jumia’s Wedding Store. 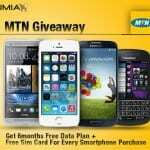 This promotion will last for four weeks and the winning couple will be picked through a raffle draw. Click Here to get amazing discounts on the latest trends in bridal Fashion, suits/tuxedos, shoes and accessories. 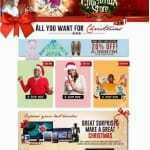 More Savings off Christmas Shopping at Jumia.